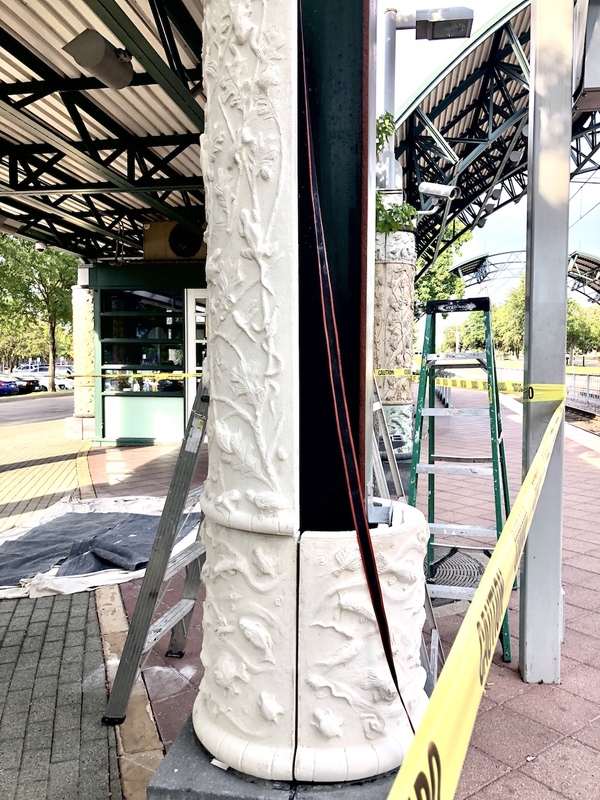 DART has been quietly replacing its "Nature's Columns" at Hampton Station, a set of about 50 decorative precast pillars that represent the natural habitat of our neighborhood's branch of Cedar Creek. According to dart.org, "Platform columns illustrate the flora and fauna of Elmwood Creek. The bottom section of each column represents water with fish and other forms of creek life. The middle section depicts tree leaves and land animals such as frogs, grasshoppers, insects, and snakes. The top section depicts birds soaring in the sky." Newly installed column (foreground) with 22-year-old columns (background) and Vaughan lyrics inscribed in pavers. 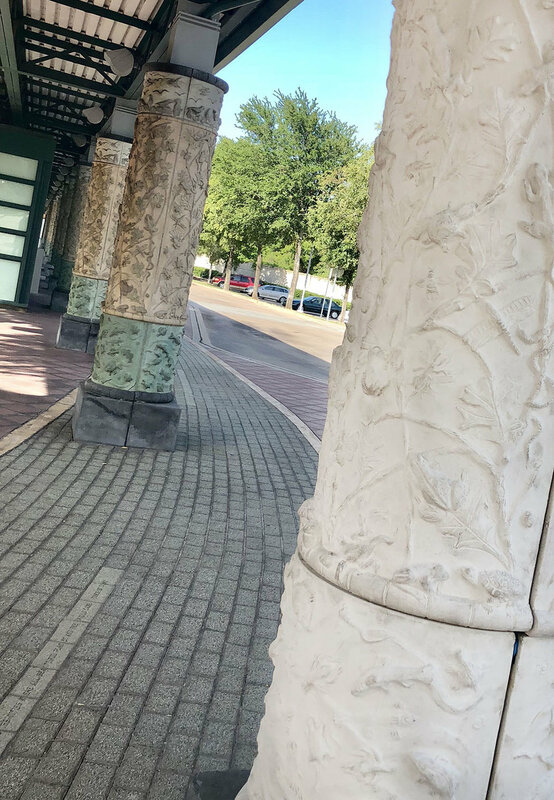 Unfortunately, over time, several of the columns – which are made of glass-fiber reinforced concrete (GFRC) – have cracked due to settling and freeze-thaw damage. DART is taking a lot of care not to the change the artwork while restoring the appearance and structural integrity of the columns. Maintenance staff took down some of the columns that were in good condition and had molds made so that they could recast exact duplicates. The agency is in the process of hiring an artist to stain the new GFRC columns so that they look like both the original artworks and each other. Work should be finished by the end of the year according to Greg Morris, the maintenance engineering specialist overseeing the project. Hampton Station is one of the original 12 stations that opened with the Red Line in 1996. Along with the columns, it features an untitled piece by artist Edwin McGowin that "incorporates stylized animals and vegetation native to the Elmwood Creek area." Additionally, pavers at the station are inscribed with lyrics from "Tick Tock" – a song by Stevie Ray Vaughan who, along with his brother Jimmie, grew up on Glenfield Ave just a few blocks southwest of here. A sculpture by Spanish artist Casto Solano honoring the Vaughan brothers will soon be dedicated in Kiest Park.